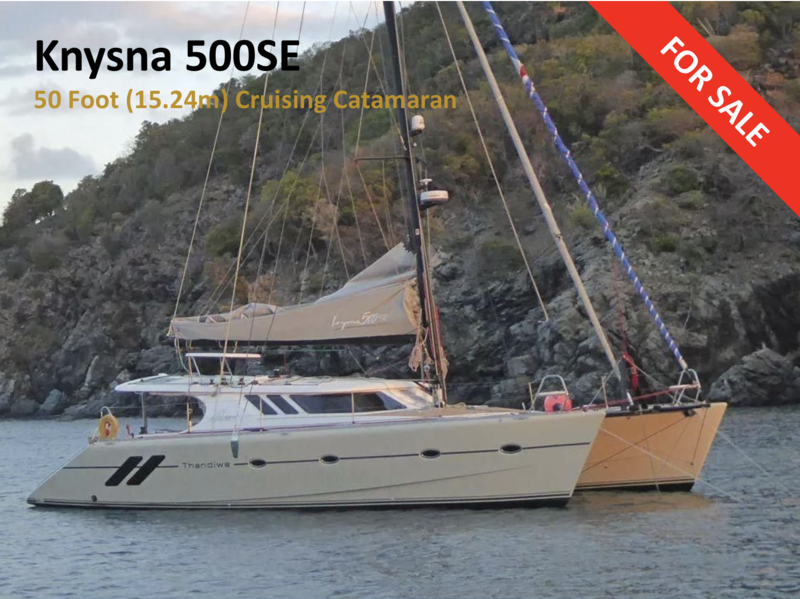 The following posts provide details of the background, history, and specification of SV Thandiwe, my Knysna 500SE (Special Edition) 50-foot cruising catamaran, which I’ve recently put on the market. Sadly, after four enjoyable years of sailing in my magnificent Knysna 500SE catamaran (owner’s version), its time to say goodbye so that my wife and I can focus our time and attention on a new project outside of sailing that will take up a considerable amount of our time. Thandiwe is ready to sail away with any new owner. VAT is paid so that potential additional expense is already taken care of. The owner’s version has three spacious double berth ensuite cabins, which have only been used by my wife and I, plus close friends and family as guests. There are also three additional berths available (Saloon daybed and Forepeak). Thandiwe has never been used for private charter. Plus the layout of her electric winches, along with an electric furler, makes Thandiwe an ideal boat for single-handed cruising. 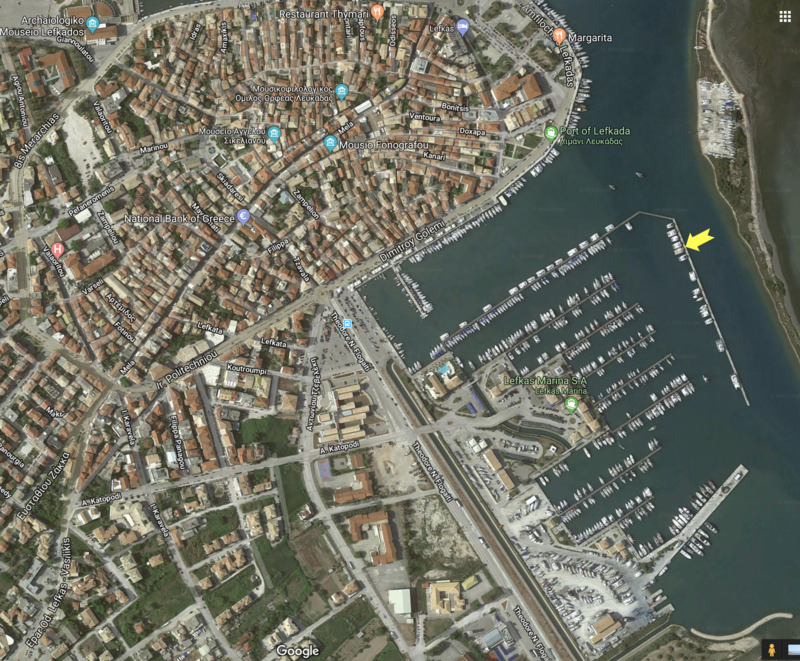 Thandiwe’s home birth is at Lefkas Marina in Lefkas Greece, at N38’ 49.8” E 20’ 42.8” on jetty J indicated by the yellow arrow, which is a great spot for watching passing traffic on the Lefkas Canal. Thandiwe’s annual mooring fees have only recently been renewed until 1 July 2019, and VAT has also been paid, which are two added bonuses for any buyer. The marina is very friendly with all the services you might require, with the added bonus of being within a short walking distance from the main town of Lefkas. The marina is also a centre for Sun Sail Holidays, being ideally located less than 30 minutes taxi ride from Preveza Airport with links to Gatwick, London and other major international cities. We have found this to be an ideal location as from here we have sailed east via the Corinth Canal and spent two months visiting most of the Greek islands in the Cyclades, including the mainland. Then south to Zakinthos. West to Italy, Sicily, and Malta, and north to Corfu. Unfortunately our time on Thandiwe this year has been restricted to just three weeks, otherwise, we could have easily continued north to Montenegro and Croatia. Thandiwe was the first 500SE to be built by Knysna Yacht Company, in their factory based in Knysna South Africa. A good friend of mine, who has owned a Knysna 440 (44-foot catamaran) for 12 years, introduced me to the idea of owning my own boat. And, for a newbie to sailing a catamaran seemed to tick all the right boxes. At the time the Knysna 480 (48-foot catamaran) was then the mainstay of the company and the first Knysna 500s were under construction. Although I loved the look and performance of the Knysna 500 I felt that the cockpit space was a bit on the small side for entertaining. However, I managed to persuade Keven Fouche, the boatyard owner, to let me come up with a design to improve the cockpit layout and then build it for me as a ‘special edition’, and at my own financial risk if it didn’t work out. I became the subject of great amusement at the Knysna Yacht Club as I knew nothing about boats, and I was telling a very capable boat builder how his design could be improved. The rest, as they say, is history. Fortunately for me, my design proved to be a great success and the Knysna 500SE, as it has become known, is now the company’s standard offering. My design mockup can be seen above, demonstrating a much larger 8 seat table with plenty of additional seating space around, while still retaining the transom behind the new curved seat in order to gain easy access to the tender and braai/barbeque. I named my Knysna 500SE ‘Thandiwe’, which is a Xhosa girls name meaning ‘loved one’. Although the extended cockpit design had worked out well, I still wanted to create more individuality, so I set about adding a number ‘extras’ to further enhance her looks and performance. One of the first things you will notice is that Thandiwe has had Stazo cork decking installed in the cockpit and deck topside, adding a richness over the standard white GRP finish. Following are a number of additional posts that highlight some of the key features that were added over and above the standard specification, which you can see in the 500SE brochure HERE. There’s also a 500SE promotional video HERE. Thandiwe was launched in December 2013 and spent early 2014 undergoing sea trials along the Knysna coastline and being used for demonstration purposes as I was back home in the UK for most of the year. Then in October 2014, Thandiwe was sailed down to Cape Town for its final handover, and the first Knysna 500SE was launched to the public at the Cape Town Boat Show, where it was hailed as the “most beautiful” and “sexiest boat in the show”. Immediately after the show, Thandiwe was delivered to the Miami Boat Show in February 2015, where its sleek lines where greatly admired and again she was hailed a great success. Even the non-sailing wives and partners of seasoned sailors where taken by the styling and in particular the finishes and facilities in the galley and cabins, plus that all important air conditioning. No creaks and groans of the infrastructure when she’s on the move either. Each Knysna 500SE is individually handcrafted, and not built in a modular form of construction adopted by the high volume competition! I have now been the proud owner of Thandiwe for the past four years, sailing in South Africa, the Caribbean, and now the Med. And, if I had a pound for every time a passerby on land or sea shouted to us “nice boat” I’d be a very rich man! Only 3-4 500SEs are hand built by local craftsmen each year, so they have become a real ‘head turner’ when seen sailing in different parts of the world. After an unexpected delay in Fort Lauderdale, we set off south-east and headed for the Bahamas, then on to the Turks & Caicos and the Dominican Republic. Unfortunately, we had missed our weather window, which meant we had to spend 10 days and nights in heavy weather with 33-knot winds directly on the nose. Not pleasant, even for seasoned sailors, which we weren’t, apart from our skipper who took it all in his stride. These rough conditions were a serious test for Thandiwe, but she passed with flying colors. Once we finally reached the BVI, the 500SE’s large trampoline and top side provided plenty of space for sunbathing and daily yoga. This seemed to be our daily routine for the rest of our three-month cruise down to Granada, where Thandiwe was left on the hard over the hurricane season.